Today I have been playing with my local council. 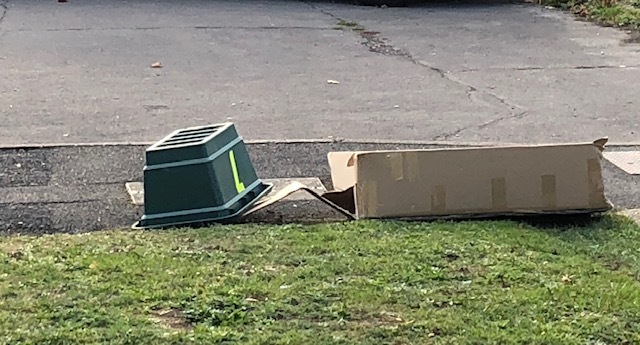 Last time I checked the website we had an agreement that large items of cardboard would be collected by the recycling lorry team if left beside the green bin and flattened. So I contacted the council via their website. I reported the incident, but then had to prove that I was a human. I decided to test whether my contact was a human. At this point I passed the “I am a human” test. I believe that my recipient did not. If it was a human, it was one with no sense of humour and limited logic. Apparently I could take the cardboard to my “local” tip. My local tip is in a different administrative area and I am forbidden to enter. I could have taken the cardboard to the council tip, and burned about £6.00 of diesel, but preferred to burn it in my garden, enjoying my pyrotechnic tendencies and staying warm in the process. This cost me one match. I have not yet evaluated the comparative environmental consequences between burning 4-5 litres of diesel fuel against one large cardboard box, but I know which was more fun. Continue reading Artificial Intelligence? Posted on October 31, 2018 October 31, 2018 Categories Life in GeneralTags AI, Artificial Intelligence, burning stuff, climate, Councils, I am a Human, Rubbish2 Comments on Artificial Intelligence? Today I was notified that a mobile telephone company had previously taken, and is planning to take, payments from my account for a telephone that has been destroyed, the account closed, and for which all direct debit authorities have been cancelled. I have today again cancelled the direct debit authority using my bank’s online facility, just as I did before. My bank informs me that I can cancel the direct debit authority, but the payee may revoke the cancellation and take the money in any case. That is not how I understood the agreement with my bank and I am disputing it. The agreement was for a flat fee of £5.00 per month, including a set level of calls. The telephone was destroyed some months ago, so why did they take without authority £9.88 last month and intend to take £5.19 next month? Since posting I have spent over an hour failing to create a user account on the Virgin Mobile website so that I can register a formal complaint. Posted on October 30, 2018 October 30, 2018 Categories Life in General, UncategorizedTags Banks, business, Direct Debit, Finance, Guarantee., HSBC, Life, life in general, Money, Suppliers, Virgin, WTFLeave a comment on Banks!! According to the “Leicester Mercury” the helicopter crash killing the chairman of their football club and four other people is “Leicester’s darkest day”. This, I presume, excludes the losses during the bombing of Leicester in November 1940, when more than 100 citizens were killed? By all means mourn the loss, but let us not get carried away and forget the past. Looking back on my blog it appears that I never got around to reporting the results of Operation Dab-It-Off from 27th December 2016. Unfortunately all photographs are also untraceable. The game was based on Len Deighton’s book “Bomber”, and I was lucky enough to obtain a flight manual for the Lancaster Bomber to help with the detail. The operation was so named because it was the fun game played at Chris Scott’s place on the Day After Boxing-day. For non-UK readers, Dab-It-Off is a form of home dry-cleaning fluid. It erases unwanted stains, including the town of Irgendwo (somewhere) in 1943 Germany. Unfortunately the pictures have disappeared into the mists of time, but the idea of the game was that each player was issued with three 1/600 scale Lancaster bombers to fly the length of a 16 foot table, bomb strategic sites in an enemy town (using tiddly-winks) and return safely home. Each player also had control of a JU88 night fighter to shoot down the opposition. Every aircraft had randomised skill ratings for each crew member, adding to the same total for every bomber or fighter. During the flight damage and equipment failures* would be rolled for against the relevant personal skill of the person responsible. The general game scale was 1 hexagon (6cm) = 4 miles and 1 height level = 2,500 feet. In air-air combat this was telescoped to about 1/5 of the above. In summary, the bombers took off in three waves, starting at 21:00. Each game turn was 10 minutes of real time. Points were awarded for successful navigation, so there was considerable jostling to fly over or near the first beacon. As the bomber stream flew over the North Sea a convoy escorted by a FLAK ship was passing*. The umpire had fun engaging the bombers as they flew overhead, and three aircraft were downed before reaching Holland. After the first Lancaster crossed the enemy coast the German night fighters were activated. (D6=6 each turn to activate). During the approach run one Lancaster was downed for the loss of one JU88. The first two bombers to arrive at the target decided to ignore the Target Indicators and flew across the target at 90 degrees to the planned approach. X-XRay was hit by FLAK immediately after bombing and crashed with all the crew lost. The remaining aircraft followed the TIs (the last one was dropped in the wrong place by the pathfinders*). 10 hit factories, 6 hit the railway yard, 4 hit the town hall and 4 the army barracks. 10 hit other parts of the railway, 46 hit residential districts and 68 landed in open countryside. The church and hospital were spared, much to the chagrin of the umpire. 2/3 of the bombers reached the target. 40% of the bombs were wasted, 15% hit valuable targets and 45% hit domestic infrastructure. E-Easy. FLAK ship hit starboard wing. Crashed, no survivors. H-How. 60 pts vital, 90 pts other targets. "A milk run". I-Item. 105pts other targets. Navigator killed. J-Jig. 120pts vital, 90pts other targets, flew home on 3 engines. K-King. 120pts vital, 30pts other targets, shot down JU88. Beers all round. M-Mike. 45pts vital targets. Navigator and bomb-aimer not on speaking terms. N-Nan. 180pts vital, 75pts other targets. Point-blank hits. O-Oboe. Engine Fire, Pilot and Navigator bailed out over North Sea, others lost. P-Peter. 45pts vital, 120pts other targets. Bombed across the stream. Q-Queen. Hit by FLAK, exploded, all crew lost. R-Roger. First to cross enemy coast. Hit by FLAK, crashed with all crew lost. S-Sugar. Engineer dealt with 3 engine failures, aircraft hit by FLAK at low level. T-Tare. 105pts other targets. Flight Engineer on Elsan throughout flight*. V-Victor. 60pts other targets. uneventful flight. X-XRay. 90pts other targets. First to bomb, across stream, but hit by FLAK and crashed. Y-Yoke. Shot down after unsuccessful bombing run by JU88. Tail Gunner bailed out. Z-Zebra. 75pts other targets. Last to reach target. Front Gunner killed. D-Dora. Shot down in combat. The game ended due to time restrictions before the bombers could return to their now fogged-in airfield, but all agreed it had been a jolly good game. Maybe other raids – Brest submarine pens, the Tirpitz, the Dambusters raid, etc. will be created for the future, but meanwhile I rest upon my laurels. *Each turn I, as umpire, drew a “Gremlin” card to randomise damage, change of wind direction or strength, enemy shipping, and other similar effects. It appears that with six months to go, our British government has finally realised that we may have to leave the EU with no exit deal. Should they not have been making preparations for this potential situation when article 50 was triggered around 18 months ago? When I voted to leave the European Union, I assumed that the UK would actually leave the European Union, as in: Goodbye, We are leaving, We are going back to the old EEC rules or even earlier. And, as more than one Irishman has pointed out, the big problem is not the “Irish Border”, but the “British Border Across Ireland”. Posted on October 24, 2018 October 24, 2018 Categories Life in General, Musings on the news, UncategorizedTags Brexit, Europe, politics1 Comment on Brexit !!! ACORN – A Comment On Random Nomenclature. In recent news it appears that the MOD (Ministry of Defence) uses far too many acronyms. In fact many are not acronyms, as in ACORN, but initialisms. They seem to be designed to include “those who know” and exclude “those who can only guess”. Some years ago, at a business seminar, the assembled middle management was requested to write on “post-it” notes what was wrong with the company. These were stuck on the wall and chosen at random for discussion*. One of mine was selected. “Too many TLAs” The obvious first question – “What’s a TLA?”. “A Three Letter Abbreviation.” Point proven. It does appear that frequently projects and departments are named specifically to provide an acronym from their name. * A second note that I submitted: “Nobody told me that we had a communication problem” was also discussed. Last Friday I visited my sister, who lost her husband on Tuesday 16th October, following an operation for aggressive bladder cancer. Visiting my sister and going through some personal paperwork it transpired that the surgeon who tried to save her husband was the same man who successfully operated on me almost a year ago. Clearly I survived my prostate cancer, but sadly Chris was more seriously afflicted and did not. He was in the High Dependency Unit for some days before finally giving up. A secondary “small world” connection was discovered when going through Chris’s address book. It turns out that an old friend of his in the folk music scene married a chap who was on the same organising committee as I was in a re-enactment society. We have never been close in a personal sense, but it seems that we were in fact more closely linked than either of us knew.